← Should you sell your investments? People have awlays been tempted to make decisions on the basis of short term, external events. This is often, though not always, a dangerous time to make big calls. In this post, I’ll give some ideas as to how to make good decisions regarding your finances. Most of us are engaging in financial planning for the long term. And I mean the very long term. Even if you’re in your seventies, eighties or even older, the odds are that you are planning for your finances for several years into the future. In the middle of 2015, stock markets began to tank, largely over concerns about the Chinese economy slowing down. (For the record, it isn’t slowing down, it is growing less quickly, which is not necessarily a bad thing). Concerns over China spilled over into stock markets all around the world, and at the lowest point some markets lost over 20% of their value. Not pretty at all. Since then, attention has turned to the oil price, and in a few weeks, something else will be a cause for concern. For most investors squirrelling money away over the long term, these are just the latest blips in a continual wave of ups and downs in the market. When markets are wobbly, there are always some who question whether this is a cue to sell their assets. One bank even went so far as to tell their investors to sell everything except high quality bonds. As I type this, the Chancellor has apparently changed his mind about fiddling with pension tax relief in his imminent Budget. The financial services industry and pension savers across the UK breathe a collective sigh of relief. But I have had countless conversations with people over the past few weeks as the rumours have been flying about, as to whether they should make a decision about investing before the budget, or lock in their lifetime allowance, before Mr Osborne changes everything. Now I’m not against taking advantage of opportunities that present themselves, or that may soon be taken away. But again, in the grand scheme of things, short-term decision making is usually a bad idea. Who will make the decisions? If there’s just you, this is easy, but if you’re in a partnership, you should decide which decisions can be made alone, and which require both of you to agree. When will decisions be made? Dealing with a major life-crossroads is not smart at 11:30pm on a Sunday. There is a much greater chance of a positive outcome if you are rested, alert, well-fed and not under the influence of alcohol. Decide on what time of the day or week you will make big decisions. Where will decisions be made? This might sound strange but if you’re in a couple, neutral ground might be good. Get out of the house and go for a walk. Sit on a beach and turn your phone off. Eliminate the distractions of a familiar environment. 24-hour news is not necessarily a good thing. We hear about world events within minutes or even seconds of them happening, and we immediately form an opinion. Sometimes, being permanently connected to the goings-on of the entire planet can be a real source of anxiety, so I suggest you consider limiting how much news you take in. You can do nothing about most of the events reported anyway, so why fill your mind with them, especially when you have important decisions to make, financial or otherwise. I’m not suggesting you become a recluse, shutting yourself off entirely from the rest of the world. But by being intentional about your news intake, you can guard your mind against the worst of it. I never watch the news before bed anymore, and usually just check into the BBC news app once per day. Investing is best done for the long term, and the old adage is true that time in the market makes more sense than timing the market. Money works best when left to compound and grow over time. Getting rich slowly is the most hassle-free way to do it. Remember the reasons why you are saving and investing in the first place. Probably they are for the medium to long term, say five years or maybe 35 years into the future. Things like one-day retirement, mortgage payoff, daughter’s wedding or son’s university fees. Let these goals and targets provide perspective when things get hot in the short term. If you’re investing for ten years, what difference does it make if the markets wobble for six-months? This is why you should never invest money needed in the short term. If you’re going to need access to money in the next 3-4 years or less, it should really remain held on deposit where market difficulties won’t affect it. Having a clear plan for your money will help you rise above short-term concerns and make better long term decisions. 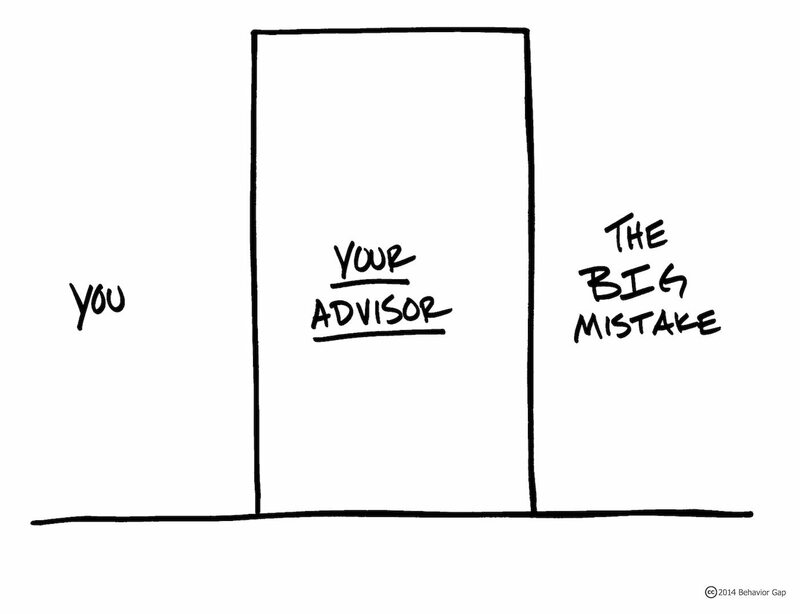 Revisit your plan regularly and remind yourself why you are investing. We all make bad decisions. If you’ve made some bad ones in the past, don’t dwell on them but move on and look forward, resolving to learn lessons for the future. It doesn’t have to be a professional adviser who helps you avoid bad decisions, it can be any trusted friend, family member or colleague. Just make sure they know what they are talking about and have some experience of making their own decisions. And they should be prepared to tell you the truth, even if you don’t want to hear it. You don’t need a yes-man, you need someone with the spine to tell you how it is, and to drag you back from the brink if necessary. The first step in making any change for the better is recognising that we need to make the change in the first place. Accepting that we have a tendency to make bad decisions can be an excellent catalyst for putting things in place to ensure or at least improve the chance of making better decisions in future. If we are intentional about decisions making, instead of wandering about from one crisis to the next, we can turn our human weakness into decision-making strength. This entry was posted in Investment and tagged decision-making, planning. Bookmark the permalink.